4 bottles in each shipment, four times per year. 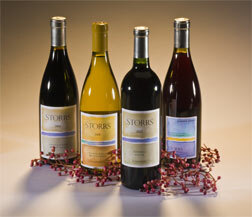 Complimentary winetasting at Storrs Winery for you and 3 guests with each visit. Discounts:10% discount on all wine purchases made from Storrs Winery; 15% discount on all case purchases made from Storrs Winery; 20% discount on all accessories and 2 or more cases purchased from Storrs Winery. Invitations to members-only events.